Although relatively small in area, Tempe has a central location in the Valley of the Sun, with good connections via the I-10, US 60, 101 and 202 freeways, to the neighboring cities of Phoenix to the west, Chandler to the south, Mesa to the east and Scottsdale to the north. The northern boundary is formed by the Salt River, here impounded to fork Tempe Town Lake, which has a semi-rural setting, bordered by a golf course, several city parks (including Phoenix Zoo and Phoenix Desert Botanical Garden), and farmland to the northeast. The extensive campus of Arizona State University lies to the south, while the remainder of the city has the usual mix of residential estates and business parks, this latter mostly to the west, along the I-10 corridor. The largest shopping center, and the location for many of Tempe's hotels, is Arizona Mills Mall, by the junction of the interstate with US 60; a busy location, but less than 2 miles from the spectacular desert scenery of South Mountain Park (the Pima Canyon Road entrance). 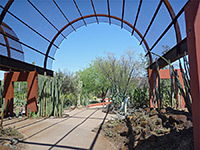 Despite its busy surroundings, next to I-10 (exit 153A; Broadway Road) on the border between Phoenix and Tempe, Marriott Buttes Resort sits in a patch of undeveloped land, surrounded by landscaped gardens and facing a cactus-covered hill, and it offers many amenities for the leisure traveler. There are two large outdoor pools, several hot tubs, a waterslide, fitness center, tennis courts, the Narande Spa, and walking trails around the nearby hill. The Diablo Stadium is right next door. Most of the 353 luxurious rooms offer fine, elevated views over the city, and all are equipped with free internet access, a mini-bar, the extra-comfortable Marriott bedding, and marble bathrooms. The hotel has five different dining outlets, and 40,000 sq ft of meeting space. Fully renovated in 2013, DoubleTree by Hilton Hotel Phoenix Tempe is a large, contemporary, resort-style property centered on a beautiful tropical courtyard garden with outdoor pool, hot tub and plenty of comfortable seating. The hotel sits just off Broadway Road, 2 blocks from I-10, and 2 miles from both Arizona Mills Mall and University of Tempe. The Light Metro is a short walk away, for easy travel to area attractions, while a complimentary 24 shuttle is provided to Phoenix International Airport (6 miles). Other highlights including the on-site restaurant (Milagro's), a lounge/bar, a 24 hour fitness center, Absolute Vitality Spa and 30,000 sq ft of meeting space. Guests at AC Hotel Phoenix Tempe are within a short walk of various natural areas, including Hayden Butte Preserve directly opposite, Tempe Beach Park just down the street and Papago Park on the far side of Tempe Town Lake. The upscale property opened spring 2016 along Rio Salado Parkway close to ASU, and also near various shops, restaurants and other businesses. The hotel has six floors, 136 guest rooms, meeting facilities, a south-facing rooftop pool, and enhanced facilities for business travelers. The Courtyard by Marriott is one of the main places to stay in downtown Tempe - 2 blocks from the edge of the Arizona State University campus and the many restaurants & bars along Mill Avenue, yet quite close to nature, with several parks either side of Tempe Town Lake just a short drive away. Also close by is a railway, however. The pink and blue building contains 160 comfortable rooms & suites, a cafe serving breakfast, a fitness center, guest laundry and 2 meeting rooms. There is an outdoor pool, hot tub and nice garden area at the front, shielded from the main road by a line of palm trees. The all suite Residence Inn along South Priest Drive provides high class extended stay or self-catering accommodation in Tempe, its 126 large rooms equipped with a full kitchen, extra sofa bed, fireplace, and separate areas for work/sleep/relaxation. Guests are treated to free hot breakfast each morning and a free social hour each evening; other meals are available from many restaurants close by, around the Arizona Mills Mall just to the west. For those cooking in their room, the hotel operates a grocery shopping service. The suites are arranged in several blocks between which are gardens, walkways, parking, an outdoor pool, bbq area and a sports court. Meetings of up to 40 people can be held in the hotel's boardroom. The second Residence Inn hotel in Tempe opened late summer 2013, centrally located beside City Hall, adjacent to University of Tempe and within walking distance of Tempe Town Lake. The extended stay property rises 11 stories above the urban neighborhood, so upper floor suites enjoy fantastic views across the surroundings. Features include a rooftop pool, extensive meeting space, a free grocery shopping service, free hot breakfast daily and free weekday evening receptions. All suites (studio, one bed or two bed) contain a fully equipped kitchen. There are many restaurants and bars close by, 2 blocks west along Mill Avenue. The 224 spacious, recently upgraded suites at the well reviewed Embassy Suites Phoenix-Tempe are divided into several three floor blocks enclosing gardens and tree-lined walkways, centered on a good sized outdoor pool - this is a large, upscale, full service establishment complete with on-site restaurant/lounge (Garcia's, serving Mexican cuisine), open for lunch, dinner & room service. Freshly cooked breakfast is provided free of charge each morning, plus a complimentary light dinner in the evenings. The suites have a wet bar with microwave and refrigerator, though no full kitchen. Other facilities include meeting space, a business center, gift shop, convenience store and fitness center. The hotel adjoins the Superstition Freeway at the Rural Road intersection, close to many retail outlets including Arizona Mills Mall, 2 miles west. A new all-suite/extended stay hotel opened in Tempe late 2016, part of the Rio Salado Business Park on the east side of Tempe Marketplace, close to the intersection of highways 101 and 202. The Homewood Suites is a four storey property that provides free full breakfast each morning, and free receptions weekday evenings (Mon-Thu). A complimentary shuttle is operated to Sky Harbor Airport (7 miles west), and to other destinations in the vicinity. All accommodations include a separate living area and a full kitchen; one bedroom and two bedroom suites are also available. Leisure amenities include a sports court, bbq grill, fitness center and outdoor pool. The Hilton Garden Inn is one of a pair of hotels (Homewood Suites is the other) within a new business park on the east side of Tempe Marketplace Mall, close to the busy 101/202 freeway intersection, and a short drive from parkland and a lake along the Salt River. A free shuttle is provided to places within a five mile radius (and to Sky Harbor Airport); also complimentary are wi-fi and hot breakfast. Accommodations include a selection of two room suites. A fitness center and snack shop are open 24 hours a day. The American-style restaurant/bar is open for lunch, dinner and room service. A business center, outdoor pool and 150 person meeting room are some of the other amenities. Open late 2017, the Hilton Garden Inn is situated towards the south side of Tempe, close to Mesa and Chandler, alongside the 101 Freeway adjoining a business park, though part of a mostly residential district, not close to any restaurants or major stores. Breakfast and dinner are available on site, however, together with room service & evening drinks, while a 24 hour market sells snacks and sundries. All guest rooms contain a microwave, refrigerator, coffee maker and desk. The hotel has an outdoor pool, a bbq area with fire pits, and a fitness center. The meetings facilities cater for events of up to 200 people. The second Hampton Inn hotel in Tempe opened early 2017, newly constructed in a quiet business district along 52nd Street, one block from the Broadway exit of Interstate 10; the international airport is 3.5 miles away, linked by complimentary, 24 hour shuttle, which also serves other destinations within a similar distance. The centers of Chandler, Mesa and Scottsdale are all less than ten miles away. There are no restaurants in the vicinity, though free hot breakfast is provided by the hotel; other amenities include a fitness center, outdoor pool and meeting space for up to 60 people. All 104 guest rooms are equipped with a microwave and refrigerator. Hampton Inn & Suites Phoenix/Tempe is situated along Scottsdale Road on the north side of Tempe, half a mile north of the 202 freeway and one mile from the edge of Arizona State University. Nearby are many restaurants, bars, shops and other business premises. Free hot breakfast is provided (take-out version available), and free coffee/tea is served all day in the lobby. Accommodations include several studio suites with sofa bed and wet bar; all 117 rooms contain a refrigerator and coffee maker. The hotel also has a business center and a 780 sq ft meeting room, plus the usual pool and fitness center. The Tempest Hotel Tempe in Tempe supplies high quality accommodation to those visiting Arizona State University or other east Phoenix locations - the nearby 101 and 202 freeways allow easy travel to places in Tempe, Mesa, Scottsdale, Chandler and beyond. The 52 guest rooms are on three floors, looking out over a mixed residential/industrial neighborhood though with the greens of Karsten Golf Course just to the north. The hotel has a small outdoor heated pool at the front, serves free hot breakfast buffet, and is within a short walk from about six restaurants. There is also a bar on the premises, featuring craft beers and local wines. Named after its street address along Rural Road, Hotel 1333 (formerly Sheraton; now part of the Marriott hotel group) has a south-central location in Tempe at the edge of the campus of Arizona State University, one mile south of Tempe Towne Lake. The nearest light rail station (Apache Blvd & Dorsey Lane) is half a mile east. About half of the 187 guest rooms and suites look out across the tree-lined garden area with outdoor pool, shielded by a wall from the parking lot beyond. There is one restaurant on the premises and plenty more within one block. 4,000 sq ft of meeting space caters for events of up to 100 people. A block south of a Marriott sister property (the Residence Inn) stands another all-suite hotel, the TownePlace Suites, offering more economical lodging though still with good facilities, very clean rooms and excellent staff. Suites are available in studio, one-bedroom or two-bedroom configurations; all have a full kitchen, and some have views over the hotel's sheltered tropical courtyard garden, at the center of which is a heated swimming pool. Free hot breakfast buffet is served, plus a free evening reception Monday to Wednesday. The TownePlace Suites is located along Priest Drive, close to Arizona Mills and interstate 10. A complimentary shuttle is provided to the international airport; other facilities are a fitness center and business center. Considered by many to be the best hotel in all of Tempe, the SpringHill Suites Phoenix/Tempe Airport has especially good customer service, beautifully clean rooms, better than usual free breakfast, and all the amenities expected for a mid range extended stay hotel, including a free shuttle to the airport (2.5 miles away), an outdoor pool, hot tub, exercise room and guest laundry. The 99 studio suites have a microwave, refrigerator and cooking/eating utensils. Apart from planes flying directly overhead, the hotel has a quiet location, away from main roads, though downtown Tempe and ASU are just 2 miles east, and the 202 Freeway half a mile north. One of a group of hotels and fast food restaurants just east of I-10 (exit 155) along Baseline Road, SpringHill Suites Tempe is well placed for visitors to the huge Arizona Mills Mall, on the opposite side of the main road. Other nearby attractions include South Mountain Park and the Phantom Horse Golf Club. The all suite hotel has 121 rooms, generally clean and bright, equipped with a refrigerator, microwave, wet bar and ironing facilities. The outdoor pool & hot tub are at the rear, away from the street, surrounded by bushes and palm trees. A complimentary shuttle is provided to the international airport, and to other places within 5 miles. Free hot breakfast buffet is served each morning. Hyatt Place Tempe is situated 5 miles east of Phoenix Sky Harbor Airport, in a business park close to the Salt River, accessed from the Priest Drive exit of the 202 freeway, and also close to I-10 and Hwy 143. The nearest restaurants are a few blocks south along University Drive. All the oversized accommodations feature a separate living area with corner sofa bed, while the complimentary amenities are wi-fi, daily breakfast buffet, and airport transportation. Drinks, snacks and light meals may be purchased from a 24 hour market. The hotel has a secluded outdoor pool, on the west side, plus a fitness center, business center and function space. The reasonably priced all suite/extended stay accommodation at Hawthorn Suites Tempe consists of 68 rooms, all including a full kitchen, cooking/eating utensils, ironing facility, safe and free internet access. Free hot breakfast buffet is offered each morning, and guests also have use of a fitness center, business center and outdoor pool/hot tub, located on the sunny south side of the property. Loop 101 runs right past the hotel, intersecting the Superstition Freeway one block south, so travel to neighborhood attractions is easy. Sites within 2 miles include Mesa Community College, Banner Desert Medical Center, Dobson Ranch Golf Course and Fiesta Mall. Right next to the Arizona Mills discount shopping mall, the Holiday Inn Express Tempe hotel has 128 spacious, modern rooms and suites on 6 floors - in a large, attractive, brightly colored building at the corner of Baseline Road and Priest Drive, towards the west side of Tempe. The hotel offers complimentary deluxe continental breakfast and is next to various restaurants; it has good standards of cleanliness, excellent customer service, and well equipped rooms that include a flat screen TV, microwave & refrigerator. The other main amenities are a fitness center, outdoor pool, hot tub, guest laundry, business center, and 3 meeting rooms. Near the middle of Tempe, AZ, the Holiday Inn Express (open January 2012) is perhaps the best of a small group of hotels serving Arizona State University, along Apache Boulevard; there is nothing too extravagant, just clean, modern rooms (and suites), efficient staff, free hot breakfast, and a convenient location, within walking distance of many restaurants and small shops, as well as ASU. The inn is 6 miles from Sky Harbor Airport and ten miles from downtown Phoenix. The other main amenities are an outdoor pool, hot tub, fitness center, guest laundry and a microwave/refrigerator in each room. The clean, modern, affordable Candlewood Suites Phoenix/Tempe hotel along Baseline Road accommodates guests in 122 good sized suites featuring a full kitchen equipped with refrigerator, dishwasher, stove & microwave; snacks and food for cooking can be purchased at the on site convenience store, though there are plenty of restaurants close by, as well as many shops at the Arizona Mills Mall, just 0.4 miles away. Guests can relax in an outdoor pool, hot tub and fitness room. Access is easy since I-10 runs by 2 blocks west, and the Superstition Freeway is a short distance north. Free laundry facilities are provided. Best Western Tempe Mall is situated close to the huge Arizona Mills shopping center on the southwest side of Tempe - the nearest shops are 0.3 miles away on the far side of Baseline Road. The well reviewed hotel has two units overlooking a pool and small but pretty floral garden area, close to many business and commercial sites in Tempe, yet just 2 miles from the start of the untouched desert landscapes of South Mountain Park. Guests appreciate the reasonable rates, the large, modern & well maintained rooms, the good quality free continental breakfast, and the helpful staff. Interstate 10 (exit 155) is one block west. The Best Western Inn of Tempe has four floors and 103 rooms, half looking out over the busy Red Mountain Freeway (202) which runs past just to the north. Access is from Scottsdale Road, which to the south becomes Rural Road, reaching ASU and the center of Tempe with its many restaurants, bars & shops after one mile. Also nearby is Tempe Town Lake, a popular location for boating, fishing, hiking and picnics. The hotel has a good range of facilities with a 24 hour restaurant on-site (Denny's), indoor pool, spa, exercise center, free deluxe continental breakfast and free 24 hour airport shuttle. New for spring 2018, Fairfield Inn Tempe is part of a business park along Priest Drive, one block south of Broadway Road, and so easily accessed from I-10 which runs past to the west. There are several restaurants within walking distance, to the east, while the nearest mall (Arizona Mills) is 1.5 miles due south. The hotel operates a complimentary shuttle to Sky Harbor Airport (4 miles), and other places in the neighborhood. Wi-fi and hot breakfast are complimentary. A coffee maker, microwave and refrigerator are installed in all guest accommodations. On the north edge of Tempe near the adjacent city of Scottsdale, the Comfort Inn enjoys an easily reached yet scenic location - beside the Scottsdale Road exit of the 202 Red Mountain Freeway, but a just short walk from both Tempe Town Lake on the Salt River and the desert landscapes of Papago Park, also the location of Phoenix Zoo and the Arizona Historical Society Museum. Complimentary amenities are hot breakfast, wi-fi and a local area shuttle, including to Phoenix Airport; other sites of interest in the vicinity are Arizona State University, Tempe Center for the Arts and Papago Plaza Shopping Center. A fitness center, business center, pool and meeting space are also available. The Comfort Suites Airport hotel in Tempe has a quiet location at the edge of a business park next to interstate 10, two blocks from the junction with the 143 Freeway and a 5 minute drive from Phoenix International Airport. There is not much of interest in the immediate neighborhood apart from a few restaurants along Broadway Road, though all sites in Tempe are close by, including ASU (2 miles), Arizona Mills (2.5 miles) and Tempe Diablo Stadium (1 mile). Rooms are clean, above average in size, and equipped with microwave, refrigerator, coffee maker & ironing facilities. An outdoor pool, free continental breakfast and free airport shuttle are the main services. At the north edge of Tempe along Scottsdale Road, the pet friendly Ramada hotel occupies an older building in a fairly quiet residential area just north of the 202 Freeway, and it offers reasonably priced lodging in a 140 room complex, built in a square enclosing a central garden area with outdoor pool, and lined by tall palm trees. Rooms are large, containing a microwave & refrigerator, and some have separate sections for living and sleeping. Free enhanced continental breakfast is served, and there are several restaurants a short walk away along the main road. The hotel can cater for meetings and events of up to 200 people. Like most hotels of this brand, Ramada Tempe at Arizona Mills Mall occupies an older building, of two blocks and three exterior corridor floors, but is offers a decent range of amenities, charges relatively low rates, and has a good location, right beside the Baseline Road exit of I-10 and just across the street from Arizona Mills, the largest mall in the state. 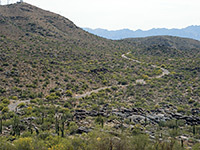 Also close by is South Mountain Park; the nearest trailhead is just 2 miles away. All guest rooms contain a microwave and refrigerator. Wi-fi and full breakfast are provided free of charge. The 149 suites at Studio 6 Tempe are divided into three blocks, surrounded by trees and situated along a quiet residential street, though with I-10 running past on the east side. Places within walking distance include ITT Technical Institute (adjacent), University of Advancing Technology and Arizona Mills Mall. All rooms have a kitchenette and wi-fi; other facilities are limited to free local calls, free coffee, guest laundry and a small outdoor pool, but rates are low and travel to other locations is convenient because of the nearby freeway. There are two restaurants just down the street. The Days Inn is the southernmost chain hotel in Tempe, positioned along Elliot Road near the border with Phoenix and Chandler, in a business district; nearby companies include Coca Cola, Nissan and Acura, while to the east is a shopping center with such stores as Costco, PetSmart and Walmart. There are 139 guest rooms available; the hotel occupies a spacious site with gardens, two outdoor pools and ample parking areas, all lined by tall palms. Rooms are on three floors, equipped with refrigerators and microwaves, and entered via exterior corridors. Several kitchenette suites are available. Wi-fi and breakfast (continental) are complimentary. Super 8 Tempe is just 800 feet from the east edge of the Arizona State University campus, located along Apache Boulevard near the Rural Road intersection. Many of the guest rooms enjoy pleasant views over the secluded outdoor pool and hot tub, which are shielded from the main street. All accommodations feature a microwave, refrigerator and free wi-fi. Complimentary continental breakfast is offered, with eight items, and there is no shortage of restaurants within walking distance, even though the neighborhood is largely residential. Near the boundary between Tempe and Mesa, the Rodeway Inn is a typical low-price, exterior corridor motel, located along Apache Boulevard, 1.8 miles from the edge of the Arizona State University campus. It is also close to Broadway Commerce Park and adjacent business districts. All rooms face west, looking across a residential neighborhood; there is one restaurant close by but others are at least half a mile away. Some guest rooms have a microwave. An outdoor pool is the main amenity. Motel 6 Tempe occupies a clean-looking, two floor building on the south side of Apache Boulevard, its 56 guest rooms looking east and west across the mixed, commercial/residential neighborhood. An outdoor pool/hot tub are tucked away at the rear, well away from the main road. Select rooms contain a microwave and refrigerator. Wi-fi is available, and free coffee is provided in the mornings. The Smith-Martin/Apache station of the light rail system is just down the street. The closest mall is Tempe Marketplace, 1.5 miles north. The Broadway Road Motel 6 borders an extensive business district towards the west edge of Tempe, one mile from the ASU campus and 1.4 miles from the nearest freeway (I-10). There are at least five restaurants adjacent, and a few small shops. Like most properties of this budget-priced brand, rooms are on two floors of an exterior corridor building, and some of them contain a microwave and refrigerator. Wi-fi, free coffee and an outdoor pool are the main amenities. Highlight of Motel 6 Phoenix Tempe is the outdoor pool and patio at the rear, lined by a few palm trees and out of sight of the surrounding roads. Also available are a coin-operated laundry facility, wi-fi and free morning coffee. Guest rooms, some of which are equipped with a microwave and refrigerator, are contained within a relatively old, three story building, also party shielded by trees. The motel is situated near the Broadway Road - Priest Drive intersection on the west side of Tempe, 4.5 miles from Sky Harbor Airport. The Motel 6 is a north Tempe property, close to the edge of Phoenix and Scottsdale, and well placed for visitors to the varied attractions of Papago Park a short distance west. The motel is one mile north of Tempe Town Lake and 1.5 miles from ASU, in a mostly residential area though within a short walk of a typical collection of restaurants and small shops. An outdoor pool is the principal amenity, at the rear of the accommodation block and surrounded by the parking lot. Complimentary morning coffee is provided.